Today is AAPI Equal Pay Day, a day to highlight the persistent wage gap experienced by AAPI women, transgender, and non-binary people. 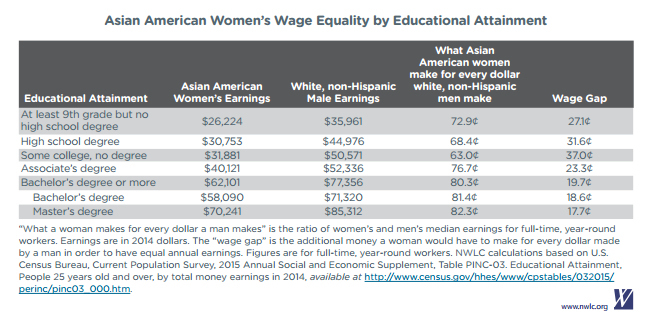 In fact, even though the AAPI community is the fastest-growing racial community in America, AAPI women continue to make only 85 cents to the dollar a White, non-Hispanic man of comparable education earns. Over the course of a lifetime, that can translate to nearly half a million dollars in lost income for AAPI women compared to White male co-workers. In fact, an AAPI woman has to achieve a master’s degree or higher just to be paid the same wage as a White man who has earned a bachelor’s degree. 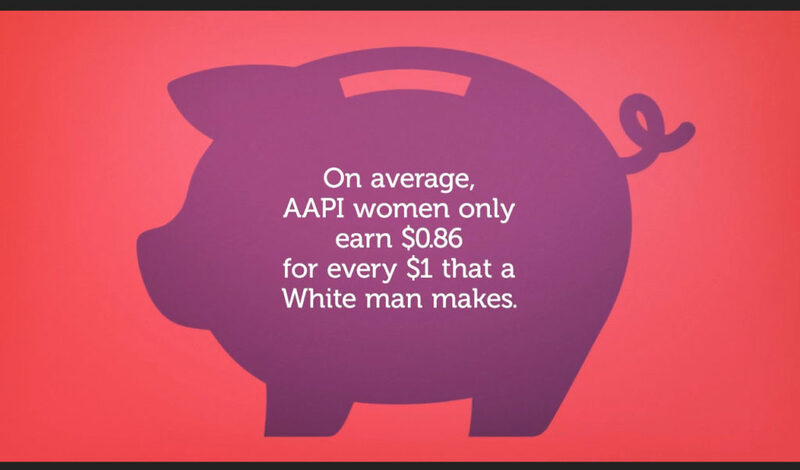 Alternatively, AAPI women must work on average an extra two months to receive the same annual income as a White man. When examining the in-race wage gap, the statistics are even more dire. Within the AAPI community, AAPI women make only about 80 cents to the dollar AAPI men earn. This translates to the largest in-group gender wage gap across all races or ethnicities. 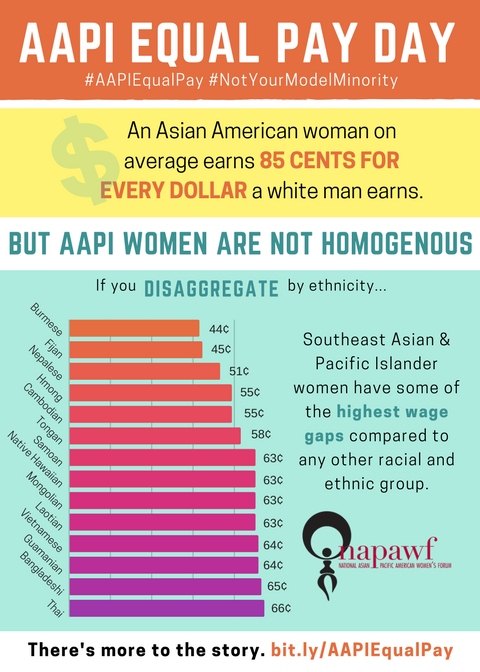 An infographic about AAPI Equal Pay Day created by NAPAWF. The wage gap for AAPI women stands firm regardless of profession. The National Women’s Law Center reports that Asian American women labourers earn 76 cents to the dollar of their White male co-workers. Asian American women customer service representatives earn 84 cents to the dollar. Asian American women physicians and surgeons earn 54 cents to the dollar. Disaggregation of wage data reveal an even more complex picture, with women of some AAPI ethnic groups earning as little as 38 cents to the dollar paid to a White man. Indeed, these statistics remind us that the Model Minority Myth obscures very real, and very complicated, income disparities within the AAPI community. While the average household income for the AAPIs is higher than that of Whites, the poverty rate is also significantly higher — and rising — among AAPIs. In particular, senior poverty rates are higher for AAPI elders compared to the overall population. For older AAPI women, this is due at least in part to the wage gap widening with age: among women aged 45-64, AAPI women earn 68 cents to the dollar White men earn. For women aged 65+, the wage gap falls by another 15 cents. Meanwhile, AAPI transgender people have a poverty rate six times that of the general AAPI community, with 18% reporting a household income of less than $10,000 a year. According to a recent election even poll, 87% of Asian Americans believe that women should receive equal pay for equal work. It’s time for us to demand equal pay for AAPI women, transgender and non-binary people, and for all people of colour. It’s time we demand passage of federal laws for equal pay, such as the Paycheck Fairness Act. We must also work to protect the Affordable Care Act, which provides healthcare coverage to 1 in 15 Asian Americans, many of whom are low-income, immigrant women. Today, AAPI groups such as the National Asian Pacific American Women’s Forum (NAPAWF) are hosting a Twitterstorm at #AAPIEqualPay. Join the conversation now and check out this simple guide to learn more.